In a disastrous/business-as-normal week for the British press, Musab Younis, Ceasefire's Deputy Editor, looks in the marginalia of the News of the World scandal, and wonders what if the Norway terror suspect had been named Jamal. Nabokov once said that he prided himself on being a person with no public appeal. Journalists have thinner skins: they tend to dislike the fact that their public appeal is several thousand notches below Nabokov’s most elaborate dreams. To take just one example, consider the parroted defence by Oxbridge-educated tabloid journalists that their output is so appalling precisely because the public demands it. It turns out that the public have been asked, on occasion, whether they trust journalists on ‘red-top’ tabloid newspapers (like the Sun, Mirror, and Star) to tell the truth. And some have said they do: ten percent. In a 2003 survey, 80 percent said they trusted ITV’s journalists; by August 2008 the figure was 33 percent. BBC news journalists faced a 21-point drop in public trust over the same period. In the marginalia of the News of the World scandal, we find that some (limited) light has been tossed on the Metropolitan Police public affairs office. This is the organisation that presents the public statements on behalf of the Met to the press, which means that it is responsible for an almost incredible amount of lying. Everyone who has been to a demonstration in London knows this: it’s why the papers when you are on your way home bear little resemblance to the events you have just witnessed. It is also the organisation which, in an ‘age of austerity’, received a major pay raise last year. We now know that 10 out of 45 staff in this unit are former News International employees. To explain this in plain words: a public body, charged with explaining the actions of the police, is largely run by people who have worked in a press organisation autocratically run by a right-wing billionaire that has been found to have fostered a network of corrupt relationships with the police, including bribery. In turn, the police have failed to investigate illegal activity by the press organisation. And in the process, when the police have acted illegally and immorally – including with actions that have led to the deaths of members of the public – the former journalists they pay have concocted lies which they hand over to their friends, who print them in the newspapers which are paying the police. The most vulgar Marxist would blush. This story has been unearthed because the Metropolitan police are now being investigated for their involvement in the News of the World fiasco – a situation which, though disgraceful enough, left no one physically injured or dead. 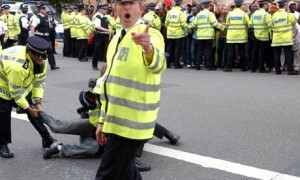 This means, of course, that the numerous situations in which the Metropolitan police have left people physically injured and dead – from de Menezes to Smiley Culture, to Alfie Meadows, to Ian Tomlinson, to the doubling of deaths of black and Asian men in police custody under Mayor Boris Johson, and so on – were not themselves serious enough to warrant such an investigation. Another over-logical argument. The News of the World mess was interesting not least because it has suggested where the press thinks the boundaries between acceptable and unacceptable behaviour should be. Overt deception is unacceptable when it can no longer be hidden, it involves illegal behaviour, its targets are highly emotive (such as murdered schoolgirls), and it implicates only one section of the press. Regular and sweeping deception – on minor issues like the Israel/Palestine conflict, the Iraq war, the domestic economy, labour relations – is another thing entirely, especially when it implicates more than one news organisation. Electronic Intifada and our very own Hicham Yezza have already done an excellent job of showing – in the context of the Oslo attacks – how the collected fact-checking machinery of the major press, from the New York Times to the BBC and the Guardian, immediately shuts down when a crime might possibly be blamed on Muslims or immigrants. If we wanted to ask whether anyone in the press offices is still capable of being embarrassed by this, we would have to consider whether they were embarrassed when they reported that 400,000 mass graves had been found in Iraq, that there was a Muslim plot to kill the Pope, that a major terrorist plot was being hatched in the North-West by Pakistani students, and so on, ad infinatum. (All these examples, and a thousand others, were reported with the credulity of a toddler in the broadsheet press, including The Guardian.) The procedure is thus: report a convenient fabrication and move on. It is lucky, at least, that we live in a post-racial society, which means that if the Olso suspect were black and named Jamal, he too would be quietly sitting in a police cell, represented by a calm lawyer who tells us that Jamal has a number of reasons for what he did, and we will hear them all on Monday – it’s the weekend, after all, and this is Europe, where we respect due process – while the press wonders wonders if Norway needs to reconsider the way it discusses political issues. Musab Younis is Ceasefire‘s deputy editor, and a postgraduate student at the University of Oxford. « Previous: Oslo Attacks: “Analyst” realises his prediction was wrong. Predicts again.